Making blueberry jam is a perfect way to preserve the taste of summer. 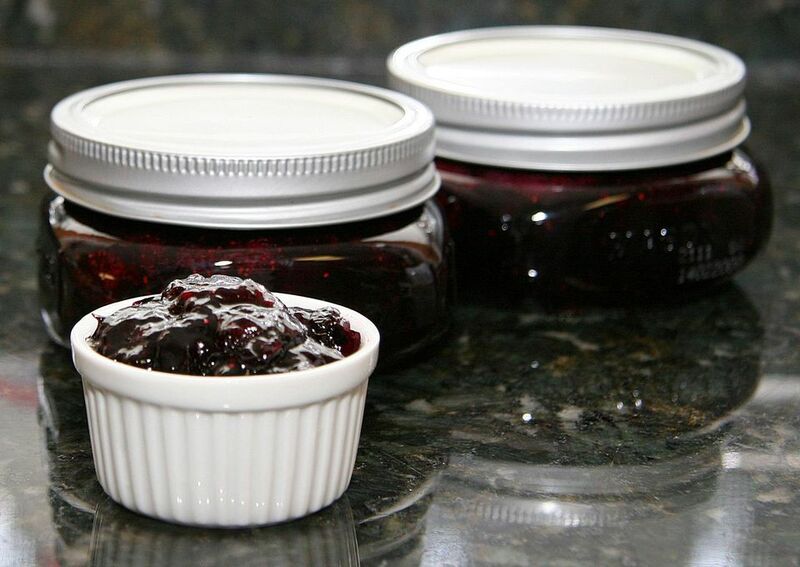 Enjoy this delicious blueberry jam on your biscuits, scones, or muffins throughout the year. This is an easy recipe to follow and prepare using commercial fruit pectin. The best blueberries to use for jam are those that are just ripe. They will have the best acidity and tannins to give the jam a more complex flavor. If your blueberries are too ripe, the skins can be leathery. If you don't have access to fresh blueberries, you can make this recipe with frozen, thawed blueberries. Your homemade blueberry jam makes a great gift. You can use decorative jars or make attractive labels. Prepare the water bath canner and jars. Add water to a canner with a rack; add cleaned jars and bring to a boil. Reduce heat to keep jars hot. The water should be high enough to be at least 1 inch above filled jars. Heat water in a small saucepan; put the lids in the saucepan and bring almost to the boil; lower heat to very low to keep the lids hot. Scald jars in boiling water and keep warm. Pour about 3/4 of the berries into a large pot and mash. Stir in the remaining berries, sugar, and lemon juice. Stirring constantly, bring to a rolling boil which cannot be stirred down. Immediately add the pouch of fruit pectin. Stirring constantly, bring back to the boil and continue boiling for 1 minute. Skim off excess foam, if necessary. Ladle the hot berry mixture into the prepared jars. With a clean dampened cloth, wipe the rims of the jars. Place the flat lids on the jars, then close caps with screw-on rings firmly. Arrange the filled jars in the canner and add more water, as needed, to be at least 1 inch above the jars. Bring to a full boil. Cover and continue boiling for 10 minutes. Remove the preserves to a rack to cool completely. Check for seals (the middle of the caps should have made a popping sound while cooling and will stay down). If any of the jars haven't sealed, you can refrigerate the jam and use it within a month, or freeze it in a plastic freezer container and use it for up to one year. Label the cooled, sealed jars with the contents and the date. Store your jars of blueberry jam in a cool, dark place and enjoy the jam for up to a year. You may notice that it begins to darken and thin towards the end of that period, so be sure you are using the jam within that time limit.